Yesterday I engaged my entire family in cleaning out our entryway closet. 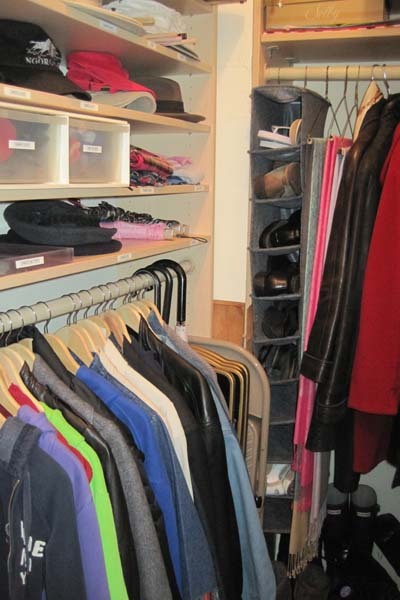 We are lucky enough to have walk-in closets — designed by California Closets before we bought the apartment — so it is actually possible to see everything that’s in there. Therefore, I knew we had a few items that we could get rid of. Frankly, I am amazed at how much stuff we are giving away! Remember the carpet bag that Mary Poppins carried? She was able to pull all sorts of incredible things out of it — including a wall mirror and floor lamp as tall as she was! I think my entryway closet must be Mary Poppins’s closet. How else to describe the piles of stuff that came out of there? The closet still holds plenty of items in these categories. But we had too much! Too much to ever use in our lifetimes. I’m sure there were things that I haven’t touched since we moved in here 10 years ago. We also pulled out all the shoes and boots that live on the bottom of the closet, vacuumed and cleaned the floor, then put the shoes and boots back in a more rational fashion. The shoes were so often cluttered in the middle of the floor that I began calling this our “trip-in closet”. This is a closet that we all use several times a day, and I’m delighted that we can now more easily reach the things we really use and that there is now room for expansion. Take some time to attack your most frequently used closet. If it’s too much to do at once, divide it into sections (hanging items, shelves, floor) and do them at separate times. Get the whole family involved. You’ll be amazed at how much easier life will be when you’ve cleared away what you are no longer using. Now, if you know where I can buy one of those Mary Poppins handbags, let me know.